These students are currently student teaching, and they will receive their certificate and regalia cord in May before graduation. Congratulations to the students and to the faculty who helped guide and mentor them during their time at Texas State University! This entry was posted in alumni students faculty NEWS and tagged TMEA Collegiate Music Educator Award on March 27, 2019 by Meagan Hernandez. Texas State String Project student teachers Azariah Reese, Chelsea Piel, Daniel Cavazos, Giselle Izaguirre, Logan Thoeni, and Payton McIntyre presented as part of the “Best Practices in National String Project Consortium” session at the 2019 National American String Teachers Association Conference in Albuquerque, NM. The “Best Practices in National String Project Consortium” session brought together String Project student teachers from universities across the United States to share current methodologies and approaches used in String Project classes. 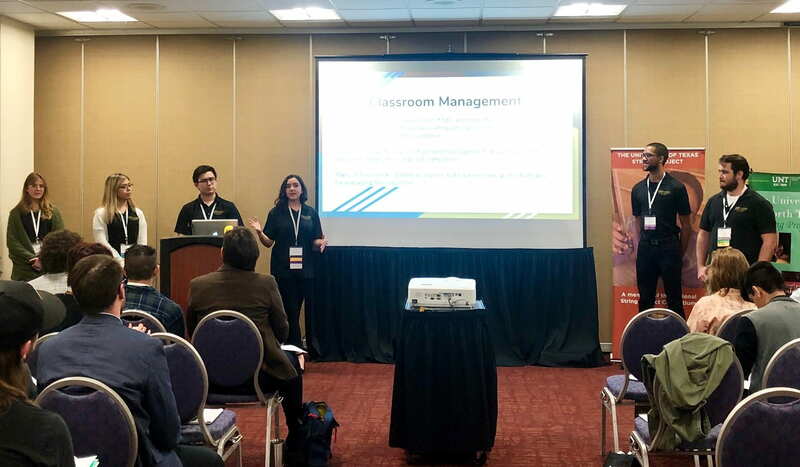 The Texas State segment, titled “If You Don’t Want to See it Forever, Don’t See it Ever,” demonstrated tips and tricks to quickly extinguish classroom management issues before they become a problem. The Texas State String Project is directed by Dr. Ames Asbell with master teacher Dr. Rebecca Tast. This entry was posted in alumni students faculty NEWS and tagged National American String Teachers Association Conference, Texas State String Project on March 15, 2019 by Meagan Hernandez. Three School of Music outreach projects for children and youths presented a wonderful joint concert March 4 in Evans Auditorium. The Hill Country Youth Chorus is directed by Lynn Brinckmeyer, assisted by accompanist Joung-A Yum and student interns Katie Wilson, Sara Trogdon, Anarra Whitcher, and Lyndsea Woodall. Mariachi Infantil is directed by John Lopez, assisted by interns Arianna Jefferson, Luis Leal, and Ivan Rodriguez. The Texas State String Project is directed by Ames Asbell with master teachers Rebecca Tast and Karla Hamelin and interns Gregory Bowen, Mae Steven, Azariah Reese, Daniel Cavazos, and Izayah Gomez. The concert concluded with an amazing feat, presenting all three groups, 61 children, performing together and singing in Spanish the tune, El Venadito. All three of the youth ensembles provide opportunities for music learning to the greater San Marcos community. Children, adolescents and family members attend weekly rehearsals both on campus and off campus. The three groups perform a variety of concerts in the surrounding community. Each of the ensembles offers professional development experiences for music students who are studying to become music educators. This entry was posted in alumni students faculty NEWS and tagged String Project, youth chorus, Youth Mariachi on March 8, 2019 by Thomas S. Clark. McCain also performed with the Colour of Music Festival Orchestra at the Carnegie Music Hall of Pittsburgh. This entry was posted in alumni students faculty NEWS and tagged Chinese University of Hong Kong, Colour of Music Festival, Hong Kong Academy of Performing Arts, Hong Kong Baptist University on March 8, 2019 by Thomas S. Clark. This entry was posted in alumni students faculty NEWS and tagged National Trumpet Competition on March 8, 2019 by Thomas S. Clark. Senior Lecturer Richard Hall composed, performed and recorded the music for two screen dance films that were recently shown at international film festivals. “Shift,” which was selected into the Dadasaheb Phalke International Film Festival in Mumbai, India, was produced and edited by Texas State University dance Professor Ana Baer. Another of Hall’s composition projects for dance on film,”Wild-er-ness,” was selected for Seyr Festival of of Screen-Movement and Media Arts in Teheran, Iran. It is a collaborative work between German dancer/choreographer Heike Salzer, Texas State University Dance Department Head Michelle Nance and Ana Baer. “Wild-er-ness” was also selected for Cine-Corps Screening at the Theatre National de Bretagne, Rennes, France. This entry was posted in alumni students faculty NEWS and tagged Dadasaheb Phalke International Film Festival, Rennes, Seyr Festival of of Screen-Movement and Media Arts, Theatre National de Bretagne on March 8, 2019 by Thomas S. Clark. As project director of a 2018-2019 NEA grant, Hank Hehmsoth traveled to New York City in August 2018 to record interviews with NEA Jazz Master/historian Dan Morgenstern and his lifelong friends and other internationally recognized jazz historians. These included Loren Schoenberg, founder of the National Jazz Museum in Harlem and this year’s Eddie Durham Celebration keynote speaker, and Phil Schaap, Jazz radio broadcaster and Curator of Jazz at Lincoln Center. As a major part of the NEA grant project, a website preservation project will be hosted by Texas State and is expected to be available to the public during summer 2019. It will include recordings of the annual Eddie Durham Celebration concerts with MP3s available for download, along with each year’s program PDFs, in addition to the videos. Read the full story at Faculty Research Spotlight. This entry was posted in alumni students faculty NEWS and tagged Dan Morgenstern, Eddie Durham, National Endowment for the Arts on March 5, 2019 by Thomas S. Clark. 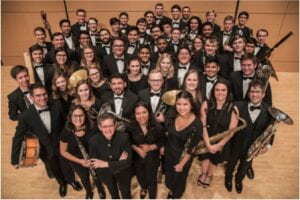 The TXST Wind Symphony, under the direction of Dr. Caroline Beatty, represented the School of Music and Texas State University at two prestigious conferences through highly-acclaimed performances. On February 15th, the Wind Symphony performed for approximately 1500 attendees of the Texas Music Educators Association in the Lila Cockrell Theatre in San Antonio. Alumni, professional colleagues, other conference members, as well as friends and family enthusiastically responded to a program that included premiere performances of music by composers Theresa Martin and Cynthia Van Maanen, recent music from Michael Gandolfi, and classics from Grainger, Berlioz, and Fillmore. The ensemble had performed at TMEA in 2015 and 2011. On February 22nd, the Wind Symphony had the honor to be one of ten ensembles selected from across the nation to perform over four days at the National Conference of the College Band Directors National Association in Tempe, Arizona. Conducted by Dr. Beatty with guest conducting by Dr. Kyle Glaser, the concert was presented in the historic Frank Lloyd Wright-designed Gammage Auditorium. The ensemble’s beauty, musicality, sound, and repertoire evoked immense enthusiasm from the professionals in attendance. The Texas State Wind Symphony has previously been selected to perform at the CBDNA National Conference in 2011 and at the Southwestern Division CBDNA Conferences in 2018, 2014, and 2008. The Texas State Bobcat Marching Band also represented the university at this important conference. 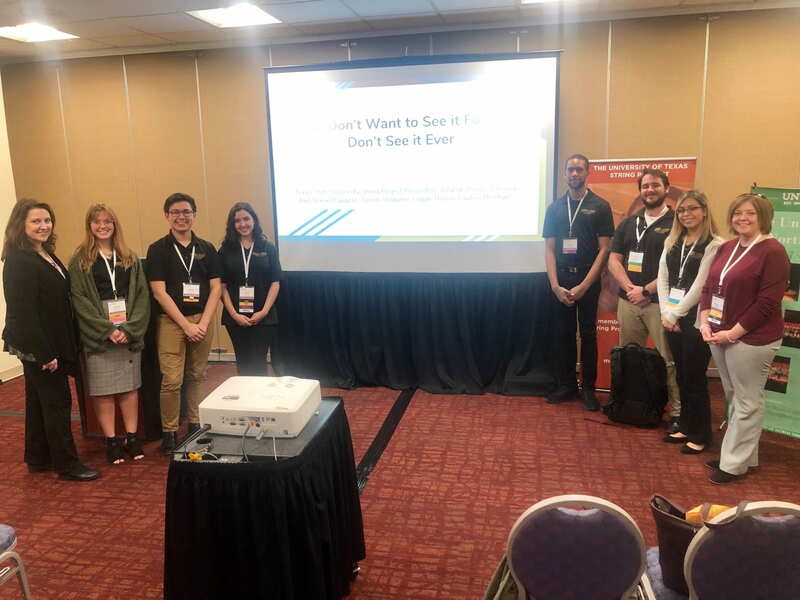 The band was selected through application to be a part of a presentation at the CBDNA conference showcasing five university marching bands including those from Texas State, Michigan State, Arizona State, Ohio State and Clemson universities. Dr. Kyle Glaser and Mr. Matthew Holzner provided information about the Texas State Bobcat Marching Band and presented a video of the 2018 Space Show. BMB has been featured previously at the National CBDNA conferences in 2007, 2011, and 2013. This entry was posted in alumni students faculty NEWS on March 1, 2019 by Thomas S. Clark.